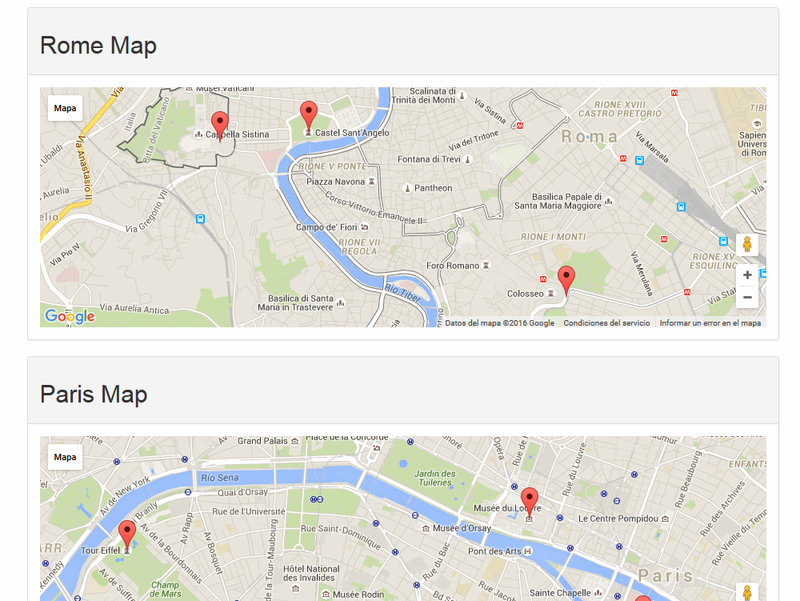 An simple solution to use Google Maps on the Back-end and Front-end. 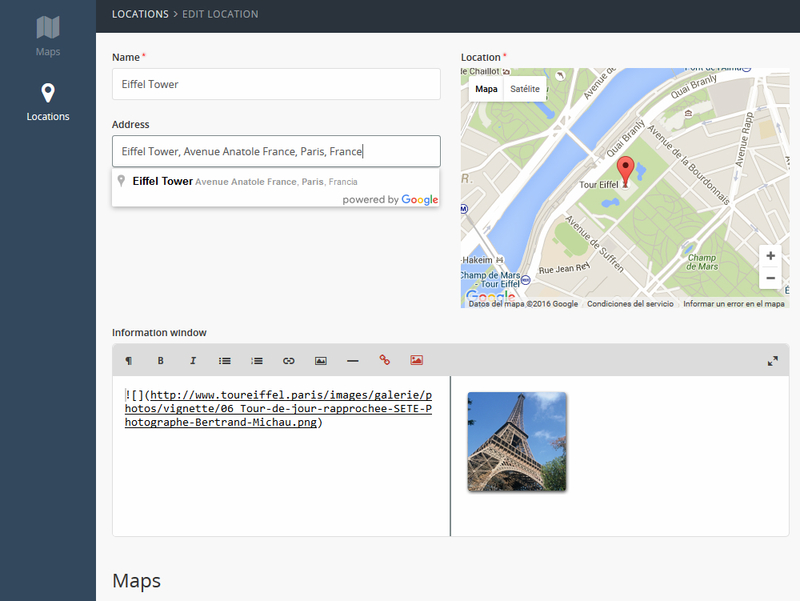 It's a solution to manage Google Maps and Markers on the back-end with a Map Behavior to be used on the front-end. This plugin it's aimed for developers by developers. It aims to be as simple as possible, that's why we give you another two plugins to serve as an example of use for free: Fencus Maps and Fencus Addressbook. It is used by us in our own projects, so you can expect for a continued development and maintenance. We try to give you the best documentation that we can make, if you don't understand something on it, please contact us so we can help you and improve the documentation. The demo uses two plugins that depends on this one: Fencus Maps and Fencus Addressbook. Do you need more functionality or have any idea to make this plugin better? Contact us, we want you to be happy and to make this the definitive solution to Google Maps for Developers on October. Renders a map and uses a marker to indicate a given position on it, it returns the value as a google.maps.LatLngLiteral object (in string format so you can store it in your database). Read the documentation for more information on how to use it. It works in conjunction with the Location Selector FormWidget. It allows you to find an address using Google Maps Geocoding Service. When an address is selected it automaticaly places the marker of the Location Selector FormWidget on it. It allows you to find an address using the Google Maps Geocoding Service. Select the initial position of the map. Select the initial zoom of the map. Enable/disable the scrollwheel to zoom in and out. Enable/disable the Map Type selector. Define the position of the Map Type selector. Define the style of the Map Type selector. Select witch Map Type to use by default. Select the available Map Types to use. Define the position of the Zoom Control. Show markers form a relation or function on the map. The API also loads additional libraries if needed: drawing, geometry, places and visualization. The HTML code generated if used on the front-end will detect if there is more than one map on the page and will manage the conflicts to avoid any problems, that means that you can show lots of maps on a single page without conflicts. A behavior to implement in your components to show a Google Map. The behavior will automaticaly use the $options, $width and $height attributes to render the map. You can pass an array of Markers to be placed on the map. You need to use the API Loader Component BEFORE the map on the HTML page. Sets an approximate position to the user using HTML5 Geolocation or based on the IP of the user through Google Geolocation Web Service. The data is saved to the user's session for further use. Geocoding from latitude-longitude (marker) to formatted address. For the time being the FormWidgets are incompatible to use in the same form (the only exeption being using the Address Locator + Location Selector). When using the Map Behavior, remember that the markers are passed to the client-side in JSON Format, if you are passing a model remember to use the $hidden attribute to define those fields that you don't wish to be publicly visible. Google API Key and default map center. Go to your backend settings, click on Fencus Google Maps Widgets. Define your Google Maps Browser API Key. Set the default map center for the FormWidgets. This will be the starting position of the maps shown by the FormWidgets. Indicates a given position on a map using a marker. height: Height of the FormWidget. (Optional, format in px or %). width: Width of the FormWidget. (Optional, format in px or %). Returns the value as a google.maps.LatLngLiteral object (in string format so you can store it in your database). 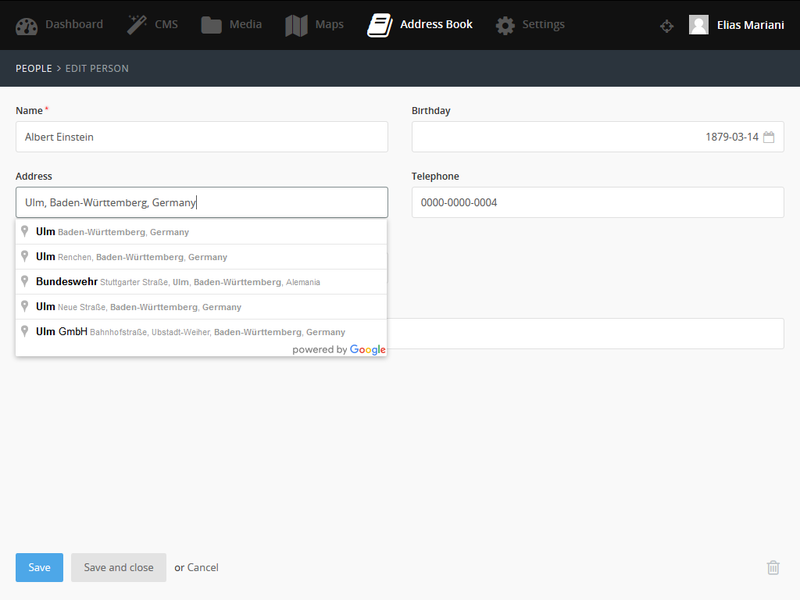 Compatible to use with Address Locator FormWidget. Incompatible with Map Configurator FormWidget and Address Finder FormWidget. 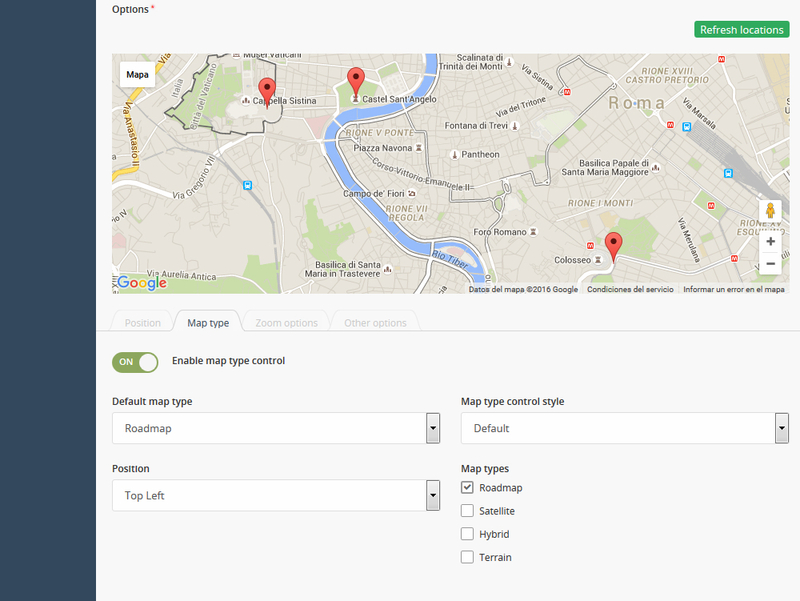 It works in conjunction with the Location Selector FormWidget, it allows you to find an address using Google Maps Geocoding Service, when an address is selected it automaticaly places the Marker of the Location Selector FormWidget on it. Returns a string with the selected address. Requires Location Selector FormWidget to be used. Incompatible with Location Selector FormWidget, Address Locator FormWidget and Map Configurator FormWidget. markers: Relation or function of the model used to get the markers (it allows Deferred binding), the models or results must have these attributes: $name, $latlng and optionaly $info_window. (Optional). $latlng: Must be a google.maps.LatLngLiteral object in String Format. $info_window: Infowindows are displayed when the marker is clicked, must be a string with html format. function: Specifies if the markers variable is a relation or a function. (Optional). The function of the model must return an array of objects with the attributes: $name, $latlng and optionaly $info_window as estated before. Incompatible with Location Selector FormWidget, Address Locator FormWidget and Address Finder FormWidget. 1- Configure your API Key on the backend settings. 2- Place the API Loader Component on your page or layout. 3- Select which additional libraries to load if needed: drawing, geometry, places and visualization. Initilizes all the maps using the Map Behavior. Because of that, you should place the API Loader Component BEFORE using the HTML code generated by the behavior. alias: Must be a name to identify this map to avoid conflicts with others (without whitespaces), if you are using this fuction on a component, the most recomendable thing is to pass the alias of the component ($this-&gt;alias). markers: These are the markers to be shown on the map, they must have the following attributes: $name, $latlng and optionaly $info_window. You need to use the API Loader Component BEFORE the HTML code generated by the Behavior. geolocation: A google.maps.LatLngLiteral object in String Format. geolocationType: This could be 'HTML5' or 'IP'. geolocationAccuracy: The approximate radius between the user and the geolocation position. You need an API Key with Google Geolocation Web Service enabled to use this component. Remember that we do not held responsability for the use of this component. Just an awesome plugin! Using the google api without this is so tricky placing locator pins in the exact position required. Using Google Map Widgets with the Maps plugin I got it first time! Saves me hours of work. This will definitely be a standard plugin for future projects.